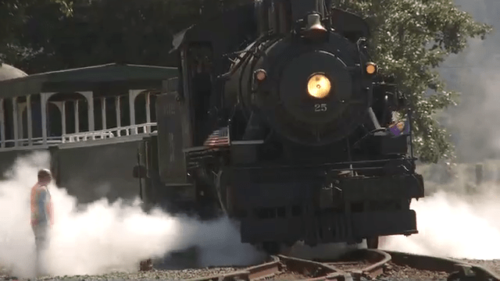 Be it hauling gold mining equipment, transporting laborers, moving logs or just bringing tourists to the coast, steam trains have played a very important role throughout Oregon’s rich history. 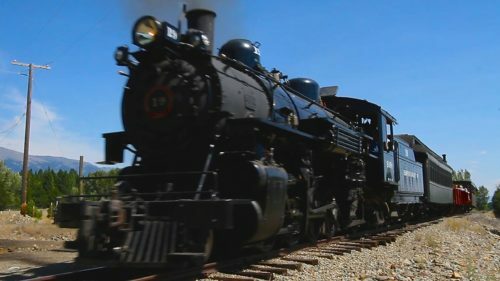 Journey to the northeast portion of our state and you’ll find the Sumpter Valley Railroad, where you can travel back in time while riding the rails aboard a restored 1890 narrow gauge steam train as it makes its way from McEwen north to Sumpter and back. White billows of steam will float overhead as you hear the chuff-chuff-chuff of the powerful locomotive and the shrill of its steam whistle calling out from sometime before the turn of the century. In the book, Oregon Road Trips – Northeast Edition, we’ve laid out how best to experience this historical Oregon attraction. 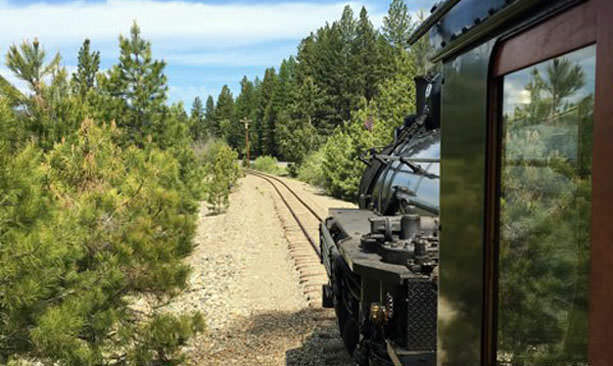 The Sumpter Valley Railroad makes round-trip journeys from McEwen north to Sumpter during select weekends and major holidays from Memorial Day Weekend through the last weekend in September. During some weekends, the train will make two round-trips, creating four departure times; two from McEwen and two from Sumpter. 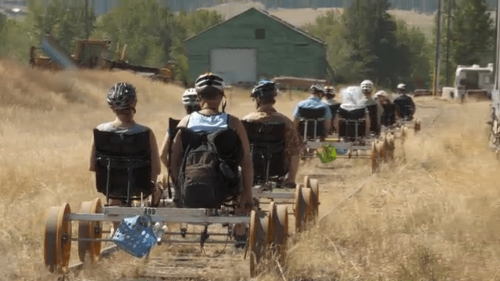 During other weekends that correspond with a large flea market in Sumpter, the train will make three round-trips, thereby creating six different departure times, three from each town. 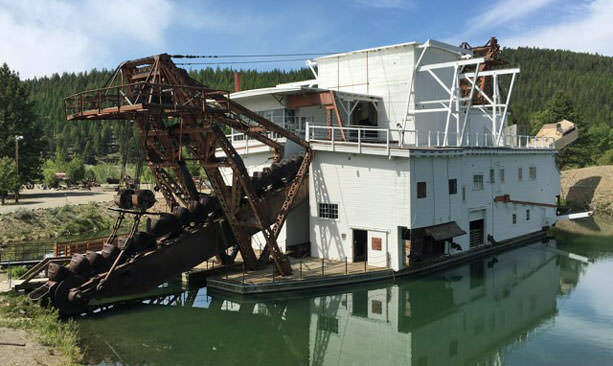 Upon your arrival in Sumpter via the Sumpter Valley Railroad, you’ll find nearby the Sumpter Valley Gold Dredge State Heritage Site, showcasing the massive Sumpter Valley Gold Dredge. One of three dredges of its kind, it extracted gold throughout the area from 1935 until 1954, when its rapacious boom carrying 72 one-ton buckets fell silent. It then sat in a state of growing disrepair until 1995, when the dredge and over 93 acres were purchased for preservation and restoration. There is no fee to visit this site. 1. Depart Baker City and drive 23 miles southwest along the Elkhorn Drive Scenic Byway (Hwy 7) to arrive at the Sumpter Valley Railroad depot in McEwen by 9:30 a.m. for the 10:00 a.m. train to Sumpter. 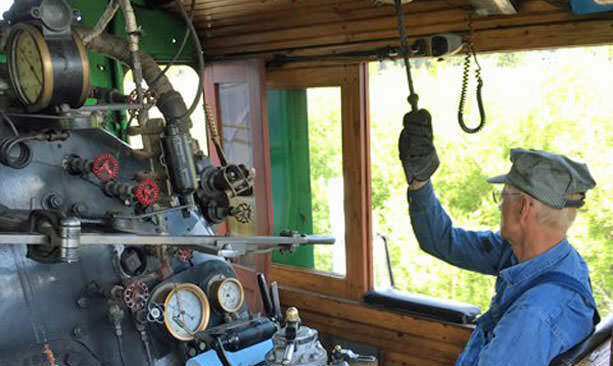 This will give you enough time to purchase your tickets and explore the train up close. Tickets as of press time are $21 round-trip for adults; ages 5-15 are $12; and children ages 4 and under travel at no charge. The travel time aboard the train from McEwen to Sumpter is approximately 45 minutes. 2. 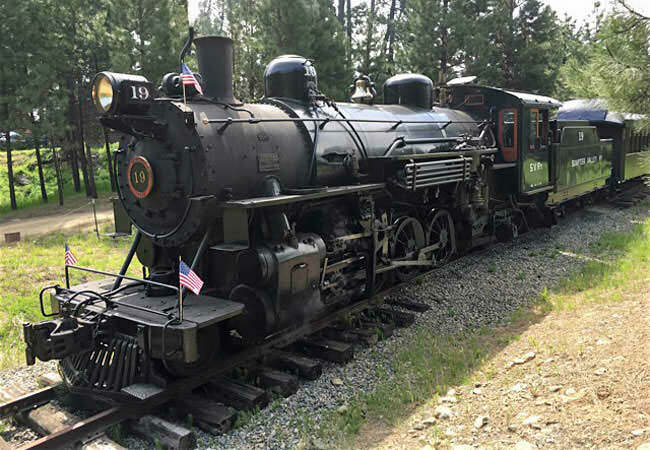 Ride the train north to Sumpter, depart and explore the Sumpter Valley Dredge State Heritage Area, showcasing the fascinating Sumpter Valley Gold Dredge. 3. Board the 11:30 a.m. or 12:00 noon train back to McEwen, depending upon the schedule for that weekend. You may either call the Sumpter Valley Railroad at 541-894-2268 or email [email protected] to make reservations. Note: We tried many times to make our reservations prior to Memorial Day Weekend using these two contacts but never received a response, so we bought our tickets, including the General Cab Pass, at the train depot in McEwen, which worked out fine. Though it is called the Sumpter Valley Railroad, the depot in the town of McEwen is the originating depot for the railway and all trains from here are round-trip to Sumpter and back unless otherwise noted. 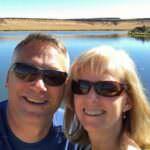 Read more about Mike & Kristy Westby’s Oregon adventures in their Oregon Road Trips books, featuring the northeast and southeast parts of the state. The books are available for purchase online. Longtime Oregonians Mike & Kristy Westby are the authors of the "Oregon Road Trips – Northeast Edition" and "Oregon Road Trips – Southeast Edition," books that help travelers discover Oregon’s scenic back roads and byways by day, while staying in historic hotels by night. When not on the road, they can be found throughout the year exploring Oregon’s many different wonders and adventures across the state.